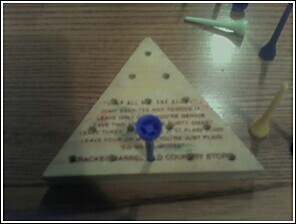 This game at Cracker Barrel in Robinson TWP told me so. It wouldn’t lie to me right? We finished recording a podcast this past Saturday and honestly I can’t remember the last time we ran out of time while I had so much content left to discuss. I’ll have to keep it for our next show or blog about it. In fact I will blog about one rant I had because I’m still in awe over the whole situation. We’re expected to get close to a foot of snow over the next 36 hours. I’m placing money that my landlord won’t have anything shoveled until the 16th… of April. God I can’t wait to move.